The next generation refrigerant industry is in the process of constant evolution. The increase in the consumption of air conditioners, refrigeration, and heat pumps, among others, provides an immense number of opportunities for the market to prosper further. At present, the next generation refrigeration industry is on the crest of technological advancement and is expected to enlarge its application areas further. Currently, a surge in demand for environment-friendly products can be witnessed among consumers. Fueled by a stringent regulatory environment and increasing consumer interest, more and more industries are moving toward products that have minimal impact on the environment. However, the existing conventional refrigerants, such as R32, R22, R134a, and R544, among others, have high global warming potential and ozone depletion potential. Therefore, they have an adverse environmental impact. However, the next generation refrigerants, such as Ammonia (R-717), 2,3,3,3-Tetrafluoropropene (R-1234yf), and 1,3,3,3-Tetrafluoropropene (R-1234ze), among others have minimal to zero global warming potential (GWP) and ozone depletion potential (ODP). The demand for the next generation refrigerant is propelling, owing to the increased preference for lesser environment harming production procedures. Natural refrigerant and Hydrofluoroolefins (HFO) are the two types of next generation refrigerants owing to their zero ozone depletion potential (ODP) and global warming potential (GWP). Natural refrigerants are naturally occurring and non-synthetic substances that can be used as cooling agents in refrigerators and air-conditioners. These substances include hydrocarbons (propane, butane, and cyclopentane), CO2, ammonia, water, and air. These natural refrigerants have negligible or zero ozone depletion potential (ODP) thereby, lowering the impact on global warming. The high efficiency of natural refrigerants has a lower impact on global warming. Some of the natural refrigerants are ammonia (R-717), carbon dioxide (R-744), and hydrocarbon refrigerants such as isobutane (R-600a), propane (R-290), and others. The report is a compilation of different segments of the global next generation refrigerant market, including market breakdown by type, end user, and geographical areas. Herein, the revenue generated from the types (Natural refrigerants and hydrofluoroolefins (HFOs)), end user (refrigeration, air conditioning, and heat pumps), and geographies (North America, Europe, Asia-Pacific, Middle East and Africa, and South America) are tracked to calculate the overall market size, both in terms of value ($million) and volume (kilotons). While highlighting the key driving and restraining forces for this market, the report also provides a detailed summary of the global next generation refrigerant market. It also includes the key participants involved in the industry at the relevant sections. • What is the global next generation refrigerant market size in terms of value ($Million) and volume (Kilotons) from 2016-2023 along with the year-on-year growth rates and the CAGR from 2018 to 2023? • What are the different types of next generation refrigerants and their growth pattern in terms of value and volume in different regions and countries? • What are the major end user industries for next generation refrigerant globally in terms of volume consumption and revenue generation? • What is the consumption pattern of the next generation refrigerant in its end users across different regions and countries? • Which are the major regions and countries that provide growth opportunities for the next generation refrigerant market? • What is the revenue generation and volume consumption of the next generation refrigerant for various applications across different countries? • What is the competitive strength of the key players in the next generation refrigerant market on the basis of their recent developments, product offerings, and regional presence? The report further includes a thorough analysis of the impact of the Porter’s Five Forces to understand the overall attractiveness of the industry. The most commonly used strategy for developing a better hold on the market has been business expansions, which accounted for 38.89% of the development strategies between the period January 2015 to October 2018. Moreover, the company profile section highlights significant information about the key companies involved along with their financial positions, key strategies, and developmental activities of recent years. Further, the report includes an exhaustive analysis of the geographical split into North America, Europe, Asia-Pacific (APAC), Middle East & Africa, and South America. Each geography details the individual push and pull forces in addition to the key players from that region. 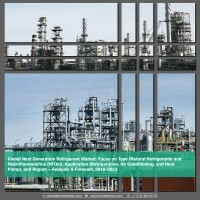 This report is a meticulous compilation of research on more than 100 players in the global next generation refrigerant market and draws upon the insights from in-depth interviews with the key opinion leaders of more than 50 leading companies, market participants, and vendors. The report also profiles approximately 15 supplier and customer profiles with their financial analysis, SWOT, and product portfolio. The companies profiled in the report are AGC Inc., Arkema SA, ASPEN Refrigerants, Inc., Daikin Industries, Ltd., Global Refrigerants, Harp International Ltd., Honeywell International Inc., SRF Limited, Tazzetti S.p.A., The Chemours Company, and The Linde Group, among others. The key end user companies profiled in the report include Carrier Corporation, Panasonic Corporation, Samsung Electronics, Ltd., and Trane Inc. In terms of value, the global next generation refrigerant market is expected to grow at a CAGR of 8.11% during the forecast period 2018-2023. The demand for natural refrigerants in the global market is expected to grow significantly, owing to the rise in the stringent government regulations, such as Significant New Alternative Policy (SNAP), Montreal Protocol, F-Gas regulations and others, to curb the usage of Hydrofluorocarbons (HFCs) and Hydrochlorofluorocarbons (HCFCs) that have high global warming potential and ozone depletion potential. The refrigeration segment accounts for the largest market share in the global next generation refrigerant market. Natural refrigerants are widely used in industrial and commercial refrigeration. Ammonia or R-717 is one of the preferred choices for large installations, whereas ozone depleting substances such as CFCs, HCFCs, and other high global warming potential refrigerants, were ruled out under international agreements. In Europe, ammonia has been widely adopted for industrial refrigeration in the U.K. and Germany owing to the usage restrictions and taxation on greenhouse gases in the countries. In terms of volume, Europe dominated the global next generation refrigerant market in 2017. The rise in government initiatives, such as F-Gas regulation against HFCs and HCFCs, has led to an increase in the demand of natural refrigerants and HFO in the region. Additionally, commercial supermarkets have largely taken over the usage of carbon dioxide as a refrigerant in its refrigeration and air conditioning systems. This is further expected to increase the demand of natural refrigerants in the region. Some of the key players operating in the next generation refrigerant market include AGC Inc., Arkema SA, ASPEN Refrigerants, Inc., Daikin Industries, Ltd., Global Refrigerants, Harp International Ltd., Honeywell International Inc., SRF Limited, Tazzetti S.p.A., The Chemours Company, and The Linde Group, among others. The key players operating in this market have increased their business expansion activities over the recent years to generate public awareness about their existing and new products and technologies and to compete with the competitors’ product portfolio. Out of the total development, 38.89% of the developmental strategies have been product launches. Driven by the rapid evolution of the next generation refrigerant, there has been a swift growth in the research and development activities by many important players in this market, leading to an increase in the number of business expansions over the last three years. For instance, Honeywell International, started a new plant in Geismar, Louisiana to produce R-1234yf in the U.S. It is a $300 million project whereby the company started the production of Solstice products in May 2017.